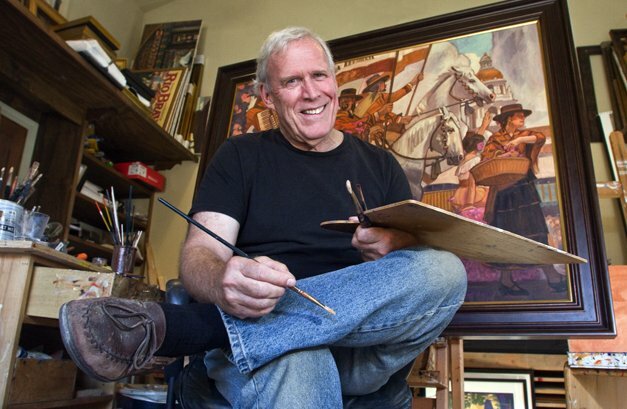 Glen Ellen artist Dennis Ziemienski has been named the 2011 Sonoma Treasure Artist. Dennis Ziemienski, an internationally-known Glen Ellen artist and prominent supporter of Sonoma Valley art events, has been named the 2011 Sonoma Treasure Artist. Ziemienski’s work is collected across the country and beyond and has been featured prominently in countless Sonoma Valley nonprofit campaigns. He created the inaugural posters for the Sonoma International Film Festival, the Sonoma Valley Museum of Art Wet Paint event and the Sonoma Valley Olive Festival, among others. Ziemineski has donated numerous paintings for auction lots to raise funds for Valley nonprofits, and organizations his work has benefited include the Sonoma Community Center, Friends of Sebastiani Theatre, Sonoma Plein Air, Sonoma Salute to the Arts, Sonoma Jazz Plus, the Glen Ellen Village Fair and Dunbar Elementary School. His paintings are featured on many well-known book covers, including “Tales of the City,” by Armisted Maupin and several covers for authors James Lee Burke and Elmore Leonard. He was chosen to create the poster for Super Bowl XXIX, the 2006 Kentucky Derby, the California Railway Museum in Sacramento, San Francisco Zoo and the Monterey Bay Aquarium. Ziemienski has taught at the California College of the Arts, the Academy of Art in San Francisco, Syracuse University Graduate class, Hartford University Masters Program and the Sonoma Community Center. And he has volunteered his time to teach art throughout the Sonoma Valley, including at Hannah Boys Center, Dunbar Elementary School and the Sonoma Valley Museum of Art. In 2011, he’s had three separate solo exhibitions in Santa Fe, Jackson Hole, Wyoming, and Los Angeles. Ziemienski is married to artist Anne Ziemienski and their daughter, Sofia Ziemienski, is a 2010 graduate of Sonoma Valley High School.